This month we are traveling to Hungary with Around the World in 12 Dishes. We have been having a great time exploring Hungary with stories, art and food. Hazel loves the name Hungary and keeps asking if the people there are always hungry. For more information about the country check out my post on the Around the World in 12 Dishes blog. 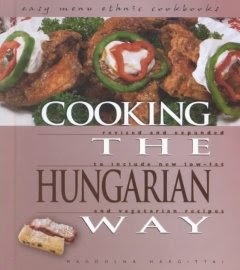 We used recipes in Cooking the Hungarian Way by Magdelna Hargittai. I let Hazel look through the book and showed her a few possibilities. 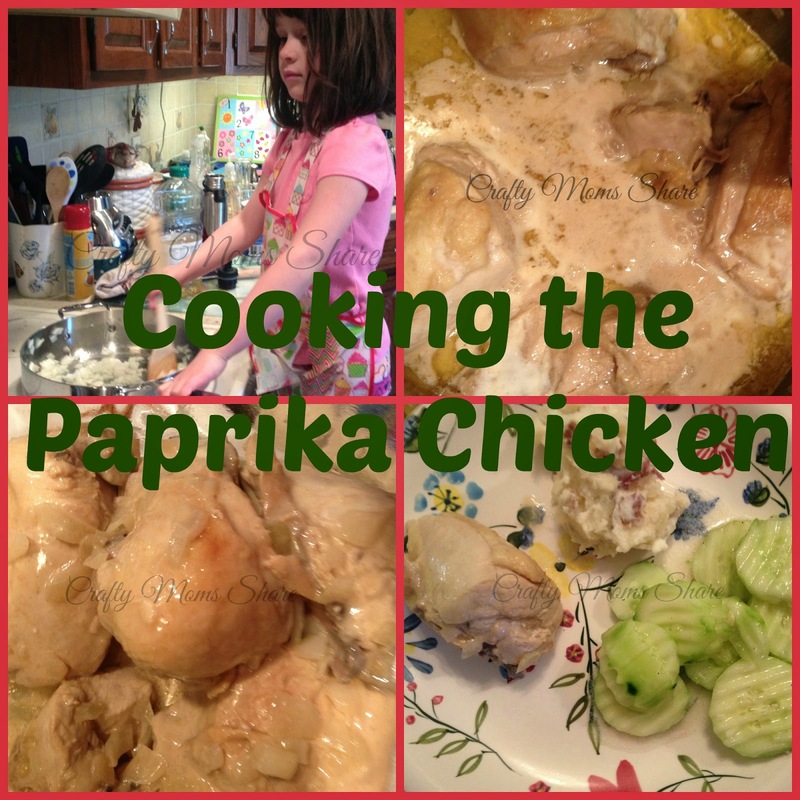 She picked Paprika Chicken and Cucumber Salad. Paprika is a spice that is used often in Hungarian food. It comes from a special red pepper. Its heat varies and it does not have to be super spicy hot. Wash and dry the chicken. Since we chose split chicken breasts, I cut them into smaller pieces. Heat oil at medium in dutch oven or large saute pan for 1 minute. Add onion and cook until it is transparent. 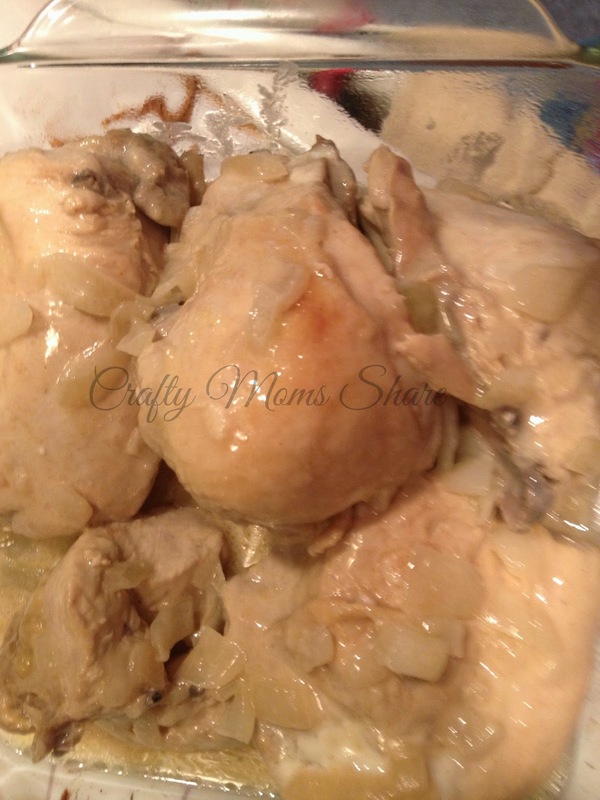 Add chicken pieces and cook, turning often until lightly brown on all sides. Sprinkle salt and paprika on chicken and add 1/2 cup of water. Cover and bring to a boil. Reduce heat and simmer for about 30 minutes or until chicken is tender. Add a small amount of water if necessary. In a small bowl combine 1 cup of sour cream, flour and 1/4 cup of water and stir well. Pour mixture over chicken and stir. Simmer uncovered for 5 minutes more. Place chicken in deep serving dish. Spoon liquid from pan over chicken and garnish with green pepper rings and remaining sour cream. Hazel helped with the sauteing of the onions and chicken. Then she mixed the sour cream, flour and water for me and helped pour it on. 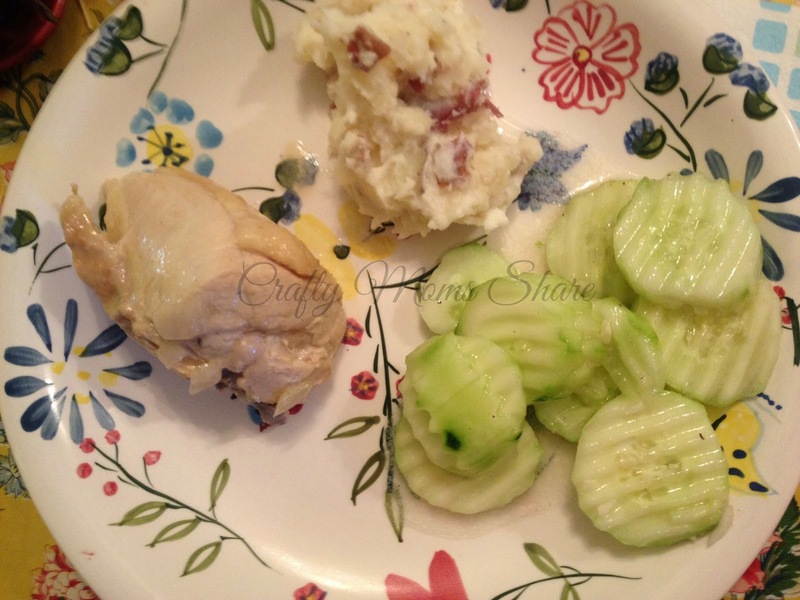 Cut cucumbers into very thin slices and place in a medium bowl. Add salt and mix well. Let sit for 30 minutes (we skipped this and it was a mistake). Mix in a large jar, garlic, sour cream, vinegar, water, oil, salt and sugar. Shake well. Drain the cucumbers in a colander and press out remaining liquid with hands (we skipped this as well--our were too runny). 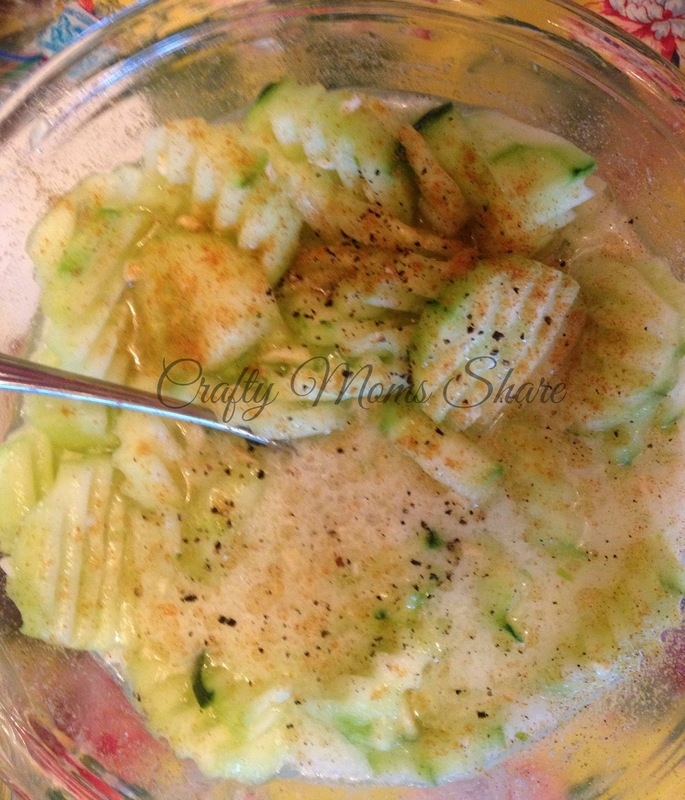 Return cucumbers to bowl and add dressing. Mix well. Refrigerate for 1 hour. Sprinkle with paprika and pepper before serving. Hazel did a lot of the work for this one. She helped peel and chopped the cucumbers. She shook the dressing and did the mixing. 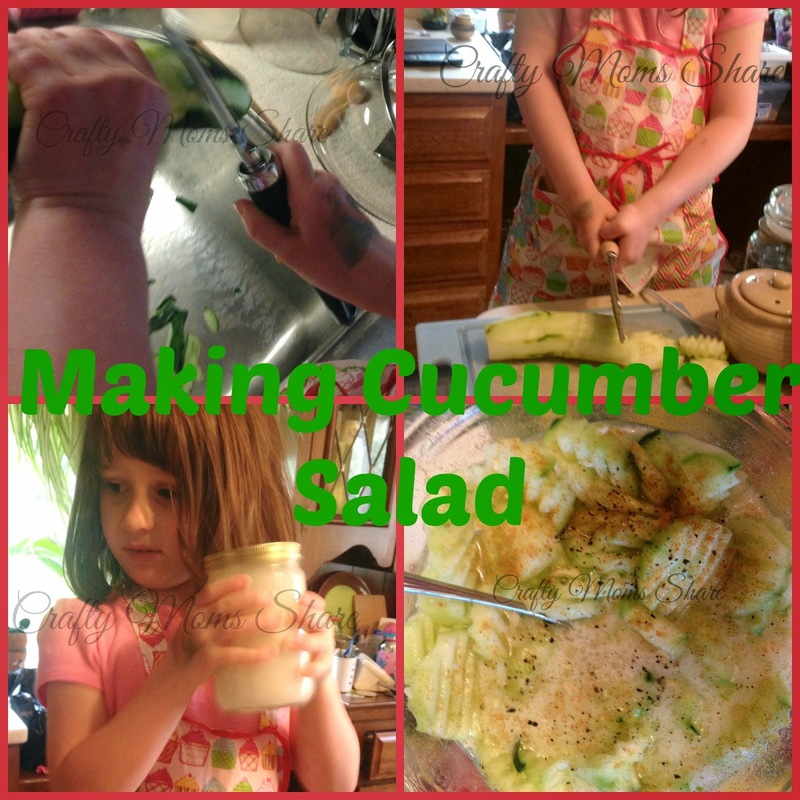 She also LOVED the cucumber salad! Overall the chicken was good and Hazel and I loved the salad. Steve does not like cucumbers so he did not try it. We also explored Op Art since one of the "grandfathers" of Op Art is from Hungary, Victor Vasarely. 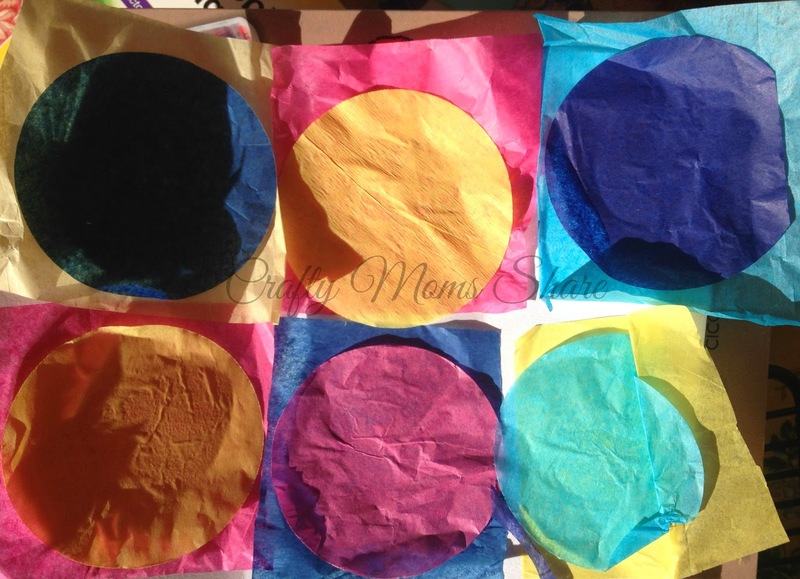 Using the book, Craft It Up Around the World by Libby Abadee and Cath Armstrong, we made tissue paper Op Art. (I reviewed this book last year.) Hazel liked making it so much we made two. 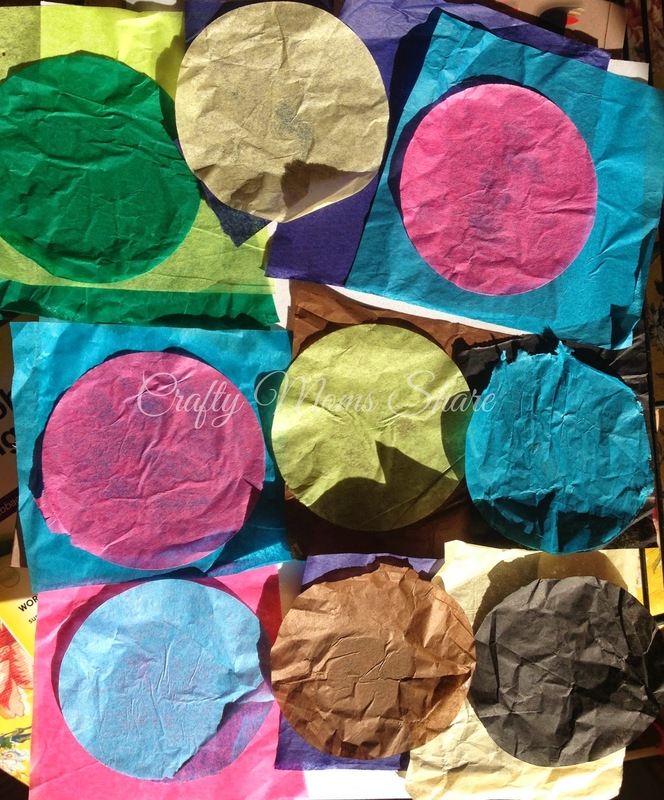 We cut tissue paper squares and used our 3-inch punch for the circles. After some play we discovered it is much easier to layer the tissue paper between two scrap pieces of regular paper to use the punch. 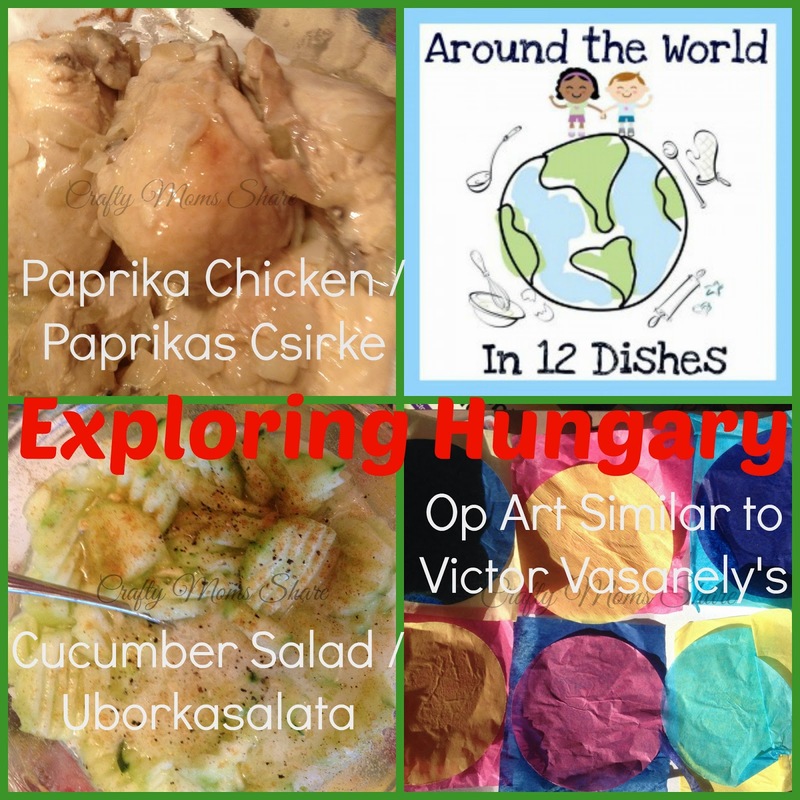 In the introduction post at Around the World in 12 Dishes blog, I shared many books to read about Hungary and stories from it. However we found one more that we really enjoyed. Hazel has been taking gymnastics for a year, so when I saw this book come up at the library for a general search for Hungary, I knew we had to read it. 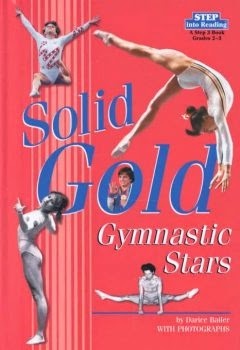 The book is Solid Gold Gymnastic Stars by Darice Bailer. The first story in the book is about Hungarian gold medal winner, Ágnes Keleti. Hazel loved hearing the stories about the gymnasts and yes we read the whole book which included Nadia Comăneci and Mary Lou Retton. I hope you will take the time to check them all out and check out everyone's great explorations of Hungary. If you have a Hungarian dish or craft or lesson, please share it here as well!! The Hungary placemat and passport pages are available for help with extra learning about the country.